Topic: facilitando la comprensión y el uso de modelos GLM, GAM y PLS. * Se presentan las bases de los modelos generalizados lineales (GLM) y aditivos (GAM) cuando se trabaja con variables respuestas que muestran una elevada carga de ceros. * Se plantea el problema y la solución a los análisis de regresión en los que las variables predictoras están fuertemente relacionadas entre sí, usando para ello el método de los mínimos cuadrados parciales (PLS). * El uso de estas herramientas se ejemplifica con el entorno de análisis de datos R, desarrollando todos los pasos necesarios para llevar a cabo un análisis detallado de los datos. [Leer 1] [Leer 2]. Topic: regional average densities of species are highly predictable from occurrence probabilities. * Quantifying species abundances is costly, especially when many species are involved. We tested whether local and regional abundances of 21 terrestrial bird species could be predicted from species occurrence distribution models, and examined the variation explained by species-specific traits. * Predictive ability of presence/absence models was superior than that of MaxEnt. At the regional level, the observed average densities of all species were highly predictable from occurrence probabilities (R2=93.5%), without overall overestimation or underestimation. * The availability of environmental energy, as measured by temperature, is expected to limit the abundance and distribution of endotherms wintering at temperate latitudes. * We model the influence of minimum winter temperature on the relative abundance of 106 terrestrial bird species wintering in peninsular Spain, at 10 ×10 km2 resolution, using 95%-quantile regressions. * Temperature explained a low proportion of variation in abundance, only limiting the maximum potential abundance of species. Species attained their maximum abundances in areas 1.9ºC warmer than the average temperature available in peninsular Spain. 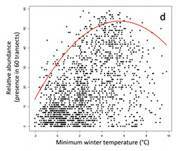 The average temperature in the area of distribution was lower than the thermal preferences of the species. * We study the thermal role of the exoskeleton in 13 Geotrupidae dung beetle species using heating experiments under controlled conditions, measuring the influence of heating sources (solar radiance vs. infrared), animal position (dorsal vs. ventral exposure), species identity and phylogenetic relationships on internal asymptotic temperature and heating rates. * The thermal response was significantly influenced by phylogenetic relatedness, although it was not affected by the apterous condition. The asymptotic internal temperature of specimens was not affected by the thoracic volume, but was significantly higher under simulated sunlight conditions than under infrared radiation, and when exposed dorsally as opposed to ventrally. 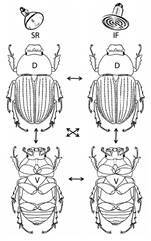 Heating rate was negatively and significantly influenced by thoracic volume independently of the source of radiation, and was significantly affected by body position (beetles heated faster when exposed dorsally).